The Minnesota Road Research Project is the world's largest and most comprehensive outdoor pavement laboratory, distinctive for its electronic sensor network embedded within 10 km (6 miles) of test pavements. The network of 4,572 sensors and extensive data collection system provides opportunities to study how heavy commercial truck traffic and the annual freeze/thaw cycle affect pavement materials and designs. 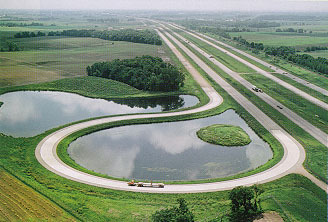 The Minnesota Department of Transportation developed the project in partnership with the University of Minnesota, the FHWA, the US Army Corps of Engineers, CRREL, and paving industries.